" Students and others who want to study biblical languages will find this a helpful tool. The authors discuss the basic principles of language: morphemes, phonemes, verbs, nouns, phrases, and clauses. They further explain how semantics, figurative language, context, and sentence structure work to produce meaningful thought. An understanding of these terms greatly facilitates the mastery of Greek and Hebrew. - Publisher A practical and easy-to-understand guide to the logical structure of both Hebrew and Greek. Ideal for biblical language students. 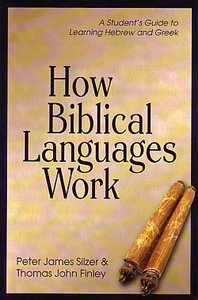 About "How Biblical Languages Work"
A practical and easy-to-understand guide to the logical structure of both Hebrew and Greek. Ideal for biblical language students. Peter James Silzer (Ph.D., Australian National University) has been a member of the Wycliffe Bible Translators and the Summer Institute of Linguistics since 1972. He served as a linguist and Bible translator in Asia from 1975-1992, and taught linguistics and Bible translation at Biola University on behalf of SIL and Wycliffe from 1992-2005. Thomas John Finley (Ph.D., University of California, Los Angeles) is professor of Old Tesament and Semitics at Talbot School of Theology in La Mirada California. He is the editor of A Bilingual Concordance to the Targum of th eProphets: Ezekiel and author of commentaries on Joel, Amos, Obadiah, and Micah.